Who would have guessed at a food swap, having a great coffee talk I would end up joining wild game groups on the net and near the woods (no I don’t hunt). My curiosity has introduced me to otherwise unknown wild game gourmets of cooks and hunters. It didn’t take too long to buy a fresh wild rabbit/hare directly from a hunter and before I arrived home I decided to prepare Sichuan style version. With the infamous dried peppers ‘Hua jiao‘ 花椒粒 and ‘La jiao’ 辣椒乾 (literal translation is flower pepper kernels and dried Sichuan chilli). Both are very distinctive spices not easily replaced if you want to add a particular heat and aroma. These ingredients are not common in supermarkets or deli stores. I have added the images for recognition. So you know what to search for at the Chinese supermarkets or Asian Toko’s. 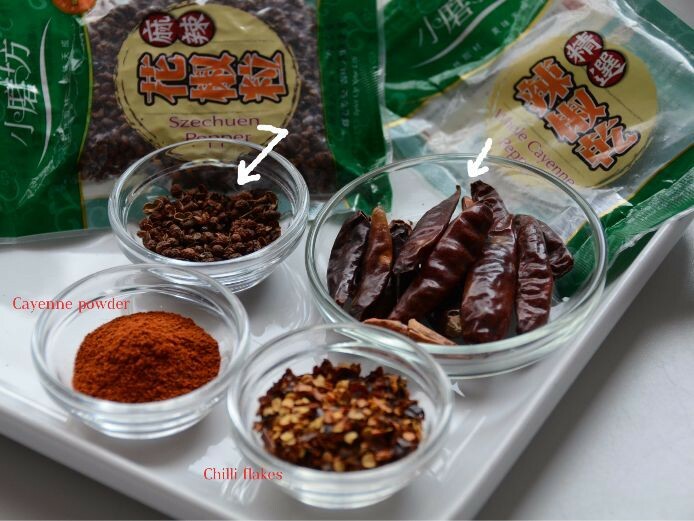 Homemade Sichuan hot chilli oil is an infused aromatic oil, made of grounded Sichuan chilli peppers (la jiao) and flower pepper (Hua jiao) to flavour the oil together with other spices. Used as a finish in many stir-fries, swirled on top of noodle soups and an integral part in marinades for spicy appetisers. A part of my last batch ended up as food gifts so I need to refill and stock up my own pantry soon. Making the oil is not for the fainthearted because using and stir-frying peppers will release a very pungent sensation and can irritate the skin and eyes. Conveniently store bought works as well, you can find these at the supermarkets/Toko’s. 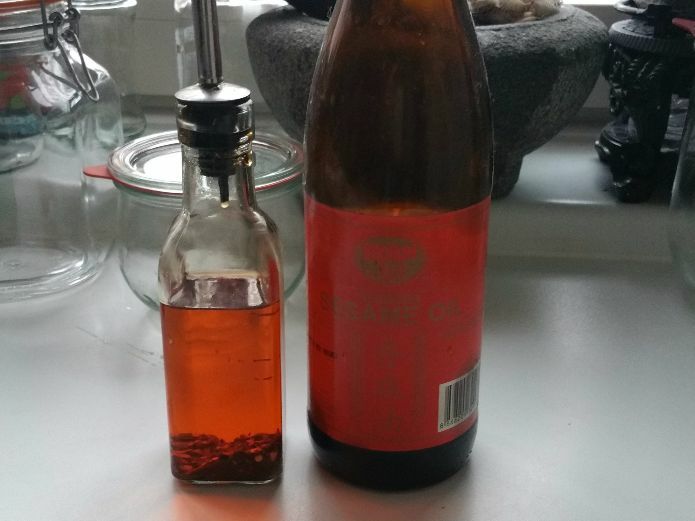 Shop for the standard Chilli oil look for an aromatic Sichuan version on the shelf. As with buying sesame oil, for advanced gourmet sleuths, they enjoy cooking with various oils for blending or cooking purposes. Buy small bottles once open use it quickly or it can turn rancid. Note of caution, sesame oil is not intended for frying, but only quick sauté for example to fragrance a dressing or sauce at the end of cooking. In my childhood rabbit meat was a staple ingredient and prepared by my parents in many dishes; stir-fries, stews, and herbal soups often paired with traditional Chinese medicine. The latter to make a tonic with the purpose of strengthening and nourishing the body. Cooking with Chinese herbs is about recuperating the body and rabbit meat is well known for its high protein content. In Chinese dietic therapy; “According to TCM food, like medicine can be divided into the characteristics cold-hot-cool-warm. When applied correctly nutritional ingredients can help the patient to overcome an inclination to or even a manifested disease. Food used to aid and act as preventive part of a nourishing diet can achieve the same goal to strengthen recovery process”. For more information on the use of tonics and food therapy, click on the links. Browse the internet for more in-depth TCM information and/or elaborate search on practices and belief system. Rabbit or Hare meat is considered foods with warming qualities, high protein level and the temperature was cold. 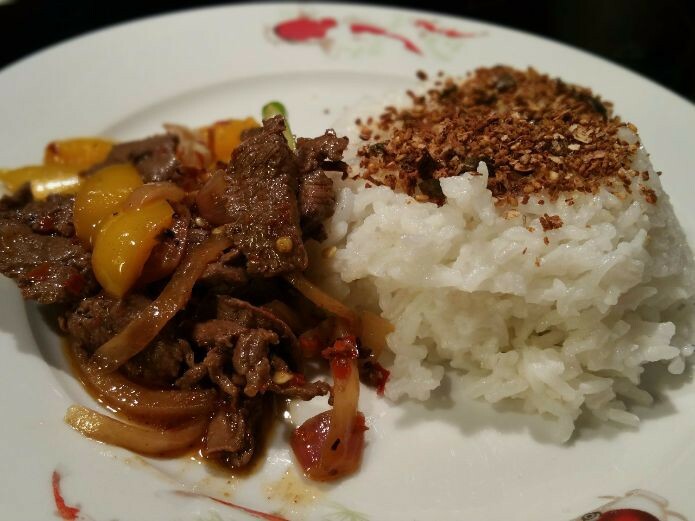 The more reason altogether to add spice in this wild game stir-fry dish bringing it all in balance. A few days later I posted food pics of my Sichuan style cooked spicy hare dish just for fun between all other social media posts. The food pics picked up attention with a request to share the recipe and preparation method. Instead of a wild rabbit, hare, you can make this dish with other meats as well, for e.g. lamb would be very nice with the peppers, capsicum, and daikon (rettich/white carrot or aka daikon). 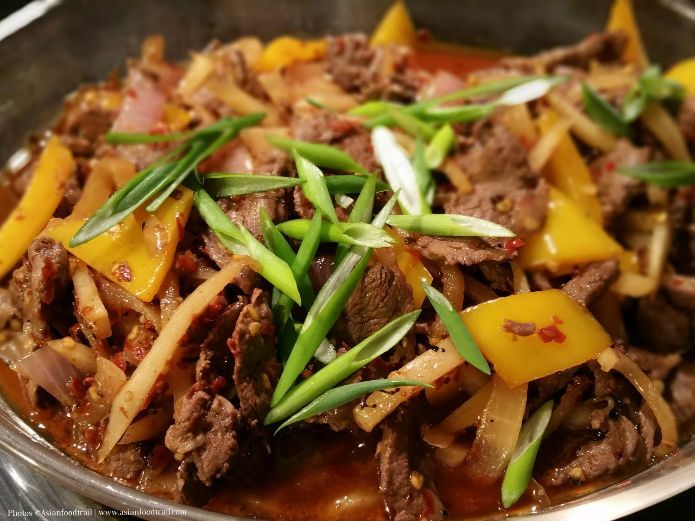 Here is the recipe link Spicy Hare stir-fry regional Sichuan style – Recipe.